Admission: $FREE on weekdays (Wednesdays-Fridays, 12-4 pm); Sundays (includes tour of decorated Jacob Blauvelt House), $7/adult; $3 for seniors, children (age 3-12) and HSRC members; children under 3 are free. In addition to our traditional dollhouse and miniature displays, this year’s exhibition will showcase the marionettes handcrafted by the late Paul Peabody of Upper Nyack. Peabody’s performance career spanned forty years, including shows throughout Rockland and the tristate area. In addition to schools, churches and community centers, Peabody performed at the Metropolitan Museum of Art, the Morgan Library, and the Cathedral of St. John the Divine, as well as at England's Stratford-on-Avon festival. Adults and children were enchanted by his unique characters, which he created using traditional woodworking methods. With a concurrent career in social justice and conflict resolution, Peabody used his marionettes, and the beautiful shows he created for them, to extend his life's work of promoting peace in our world. Also an ongoing tradition, the HSRC is also delighted to announce our annual raffle! Raffle tickets will be available throughout the duration of the exhibition. 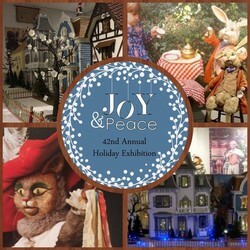 A visit to the annual Holiday Exhibition is included in the price of all HSRC Holiday Programs.